I know, sweet potato salad in May? But hear me out! On my recent visit to my grandparent’s house last month, my grandma enlisted me to help her in making a side for lunch one day. 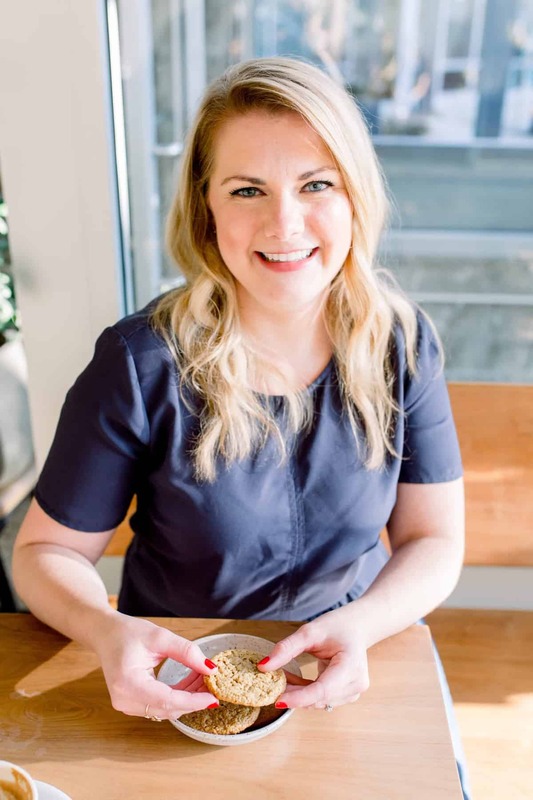 Putting our cooking minds together, we ended up coming up with a cold sweet potato salad, using up some frozen sweet potatoes she had and whipping up a dressing from an old cookbook that would please the nondairy eaters in the house. 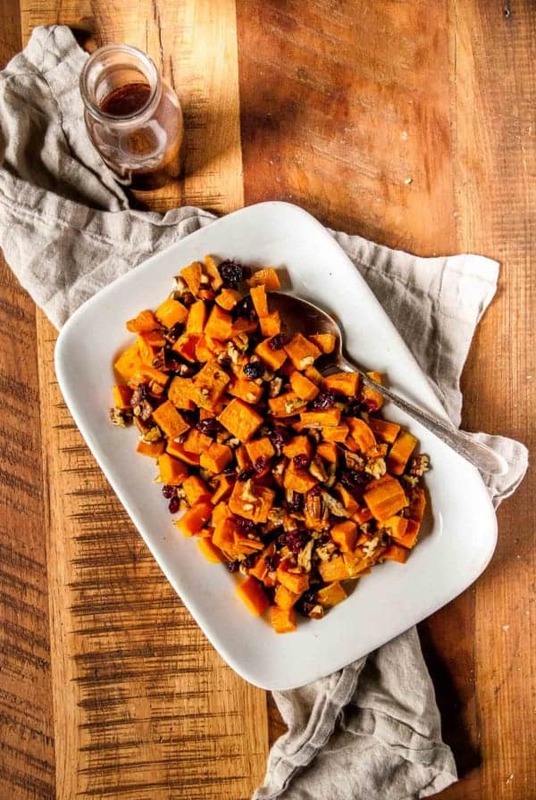 Honestly, we were kind of throwing in what was around the kitchen, with crunchy pecans and tart dried cranberries adding a little more oomph to the sweet potato salad. We kind of hoping for the best, thinking that it would be a nice side dish but not really knowing entirely how it was going to turn out. When we served it at lunch the next day, it ended up being a hit! While I usually excel more at throwing together baked desserts, this savory one turned out perfectly this time..with a lot of help from grandma. When we made the original sweet potato salad, the dressing used apple cider vinegar rather than balsamic. I was out of ACV, so I subbed in balsamic and it turned out just as good! I would recommend letting this sit and marinate together for a day, so it’s the perfect make-ahead cookout/party side dish. The sweet potato salad was great the first time we served it, but even better the next day. 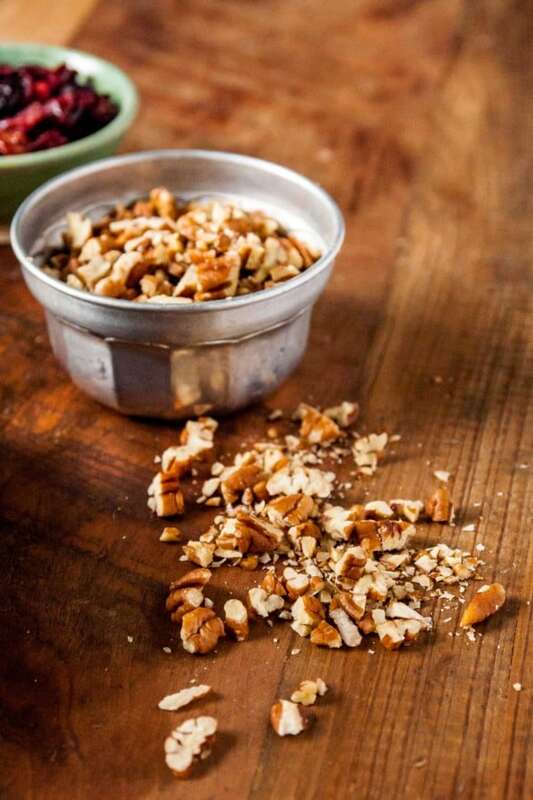 Also, if pecans aren’t your favorite, I think walnuts would pair perfectly here too! I don’t use every bit of dressing when assembling the salad, so add half to start and then go from there. The leftovers go well on any regular salad and will keep for a while in a jar in the fridge. I hope you have a lovely weekend! We don’t have much on the agenda here, other than avoiding the rain and cold weather and I’ll be developing some recipes, per the usual. Summertime seems to be the best time here in Milwaukee, so I don’t ever mind having free and loose plans on the weekends (plus, that leaves more time for beer gardens). Happy Friday! 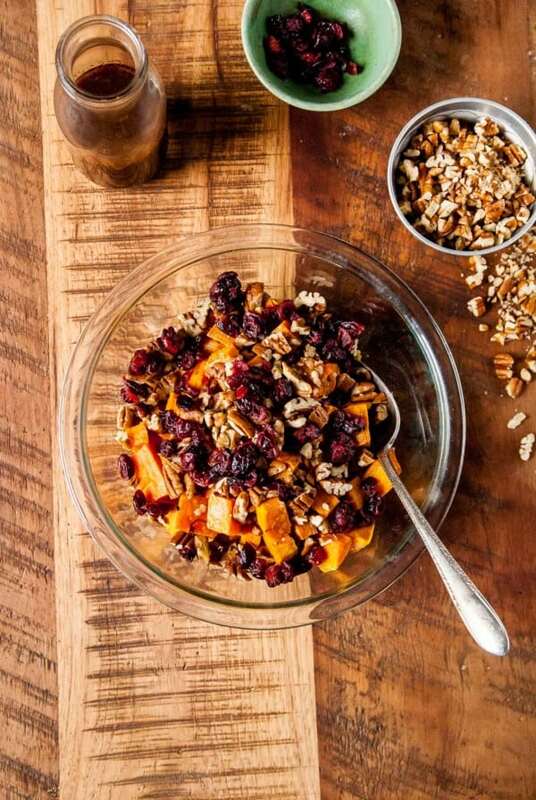 A sweet and savory sweet potato salad with pecans and dried cranberries, perfect for summer cookouts and parties! Made with a sweet balsamic vinaigrette and tart cranberries. Place the peeled and chopped sweet potatoes on the baking sheet and drizzle with the olive oil, salt, and pepper. Toss to coat. Roast for 30-35 minutes, until sweet potatoes are tender, but not overly brown. Remove from oven and set aside to cool. While sweet potatoes are cooling, make the dressing. Whisk together all of the ingredients in a small bowl, whisking generously to combine. Place in a jar and refrigerate until ready to assemble the salad. 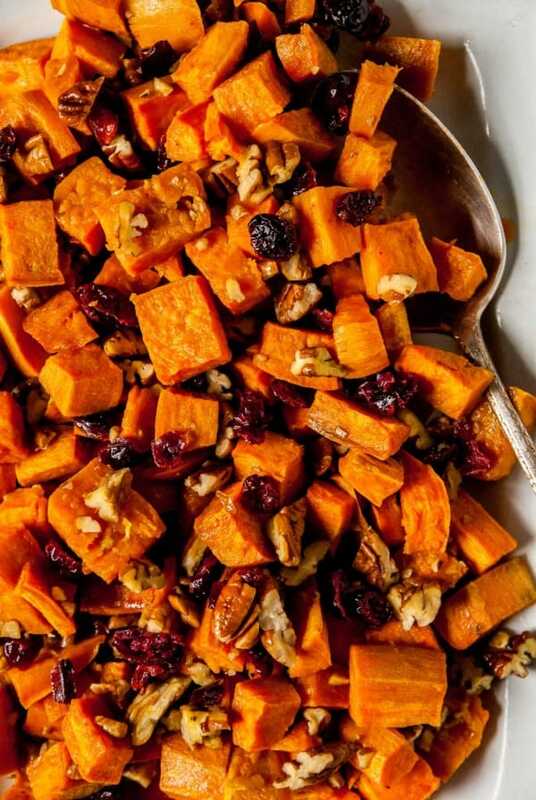 In a large bowl, combine the roasted sweet potatoes, chopped pecans, and dried cranberries. Toss together until combined. Drizzle about half of the dressing over the salad and toss to coat. Add more, if desired. Don’t use all of the dressing at once, or the salad will become soggy. Use the leftover dressing in any other salad, it’s perfect! Store leftovers in a small jar in the fridge and shake before using, to combine the ingredients again. I have some sweet potatoes that have been looking for some place to go. Will find them a home in your salad this weekend. Yum! This sounds so good! I love my sweet potatoes savory and this dressing sounds like the perfect addition!! This sounds like it’s right up your alley! I eat sweet potatoes year round, so this sounds fun to me! Plus you can play with the fruit and nut varieties! I agree! I think almonds would be lovely in here! I love sweet potatoes but I don’t know many recipes with it! Your idea seems so finger-licking, Abby! Can I also add a bit of lemon zest? Yes! I think that would be so good!